Abhaya Mudra is the Mudra (Gesture) of Protection. In this gesture, the arm is elevated and slightly bent. The hand is lifted to shoulder level with the palm turned outward and all the fingers are extended upward. This mudra is characteristic of Dhyani Buddha Amoghsiddhi. Bhumisparsa is the mudra of witness (earth touching). The right arm is pendant over the right knee. The hand with the palm turned inward and all the fingers extended downward with the finger touching the lots throne. The left hand lies on the lap with palm upward. The gesture 'of touching the earth' or calling the earth to witness' commemorating Gautam Buddha's victory over temptation by the demon Mara. This gesture is Characteristic of Dhyani Buddha Akshobhya as well as Shakyamuni. Dharmachakra Mudra is the gesture of Teaching. Literally, Dharma means 'Law' and Chakra means wheel and usually interpreted turning the Wheel of Law. In this gesture both hands are held against the chest, the left facing inward, covering the right facing outward, the index and thumb of each hand making a circle. It is characteristic of Dhyani Byddha Vairochana. It is also a gesture of hands exhibited by Lord Buddha while preaching his first sermon at Sarnath. Dhyana Mudra is the Mudra of Meditation. It is also called Samadhi or Yoga Mudra. Both hands are placed on the lap, right hand on left with fingers fully stretched and the palms facing upwards. Often, a begging bowl is placed. This is the characteristic mudra of Dhyani Buddha Amitabha. Jnana Mudra is the gesture of teaching. In this gesture, the tips of the index and the thumb are jointed and held near the center of chest with the palm turned inward. 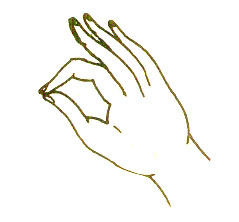 This is the characteristic mudra of Manjushree. Namaskar Mudra is the gesture of prayers. In this gesture, the hands are kept closed to the chest in devotional attitude with the palms and fingers joined. This is the special gesture of Avalokiteswara when with more than two arms. Tarjani Mudra is the gesture of threatening or warning. Only the index finger is raised while the other fingers are locked up in the fish. This mudra is characteristics of most of the wrathful deities. Vajrahunkara Mudra is the gesture of Adi Buddha, Vajradhara. In this gesture the wrists are crossed at the breast. The hands hold usually the Vajra and Ghanta This is the special mudra of Vajradhara and Samvara and most of the Gods when holding their Saktis. Varada Mudra is the gesture of Charity or conferring boon or grace. The arm is extended all way down with palm facing outwards, fingers extended downwards. This is the Mudra of Dhyani Buddha Ratna Sambhava, Avalokiteswara, sometimes, of a standing Sakyamuni. Vitarka Mudra is the gesture of argument. In this gesture the tips of thumb and index finger touched forming a circle. All the other fingers are extended upwards. This is the mystic gesture of Taras and Boddhisatwas.